SL: It's all about the learning. Supplemental Learning (SL) is academic support linked to challenging introductory courses. 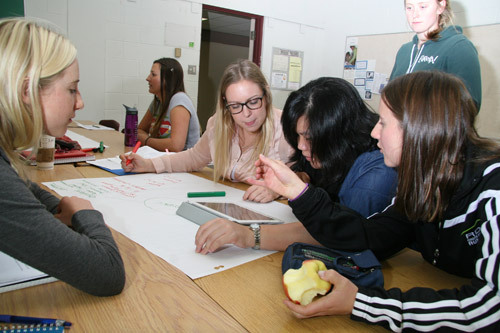 In courses supported by SL, students are invited to attend weekly sessions — on a regular basis, or occasionally. SL sessions provide opportunities to study with peers informally — and yet with a planned and strategic approach. Sessions are led by a student who has previously mastered the course and knows what it takes to succeed. Sessions integrate how-to-learn (study skills) with what-to-learn (course content) in a collaborative setting. Check the current Session Schedule to find out if any of your courses are supported by SL. Sessions start one full week after classes begin (listen to leader announcements for exceptions, and for information on exam reviews); regular weekly sessions end when classes end. Watch for final exam reviews to be posted in the final weeks of the term. Follow the link to see our current session schedule. Also, listen to in-class announcements for details about special exam review sessions. Studying with a group of peers will be more effective if you work together regularly. Attending SL weekly can help keep you on track and motivated throughout the semester. But it's never too late to improve your study habits: if you have the opportunity to attend a session and haven't yet — start today!